Are you looking for the perfect waterproof drone? 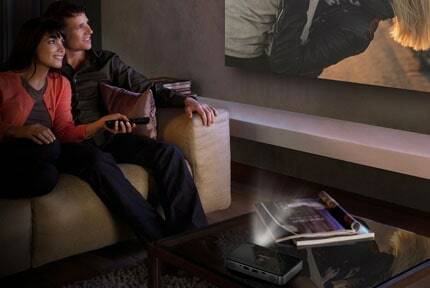 Are you struggling to find one that has great features but is also waterproof or splash proof? If so then you have come to the right place. We have carried out extensive research in order to find the best waterproof drone on the market today. We had a range of qualities in mind when testing these drones. We wanted to find a drone that was rich in features, easy to control and also one that you could have a lot of fun with around and in water. If you are looking for a similar drone yourself but you are not sure which drone is going to be the best one for use in and around water or which waterproof drone you should pick to get the best value for money then keep reading. The table below shows the top waterproof drones right now. These drones have been chosen carefully thanks to our extensive research on the subject so that you can find the best waterproof drone for your budget and needs. Well, without wasting any more time, let’s jump right on our list of the best waterproof drones out there. Produced and sold by Maxbo, this nifty little waterproof drone is one of the best drones for the money. This drone has a really great set of features but it won’t break the bank because it has a very affordable price tag. This drone can be fully submerged in the water without causing any damage. It is possible to fly the drone right into the water and then back out, provided the propellers are not submerged. Even when the drone is fully submerged it can be put back into flight immediately after being lifted out of the water. You can achieve a very stable flight with this drone thanks to its 6-axis stabilization system and it has a flight time of between 6-8 minutes. 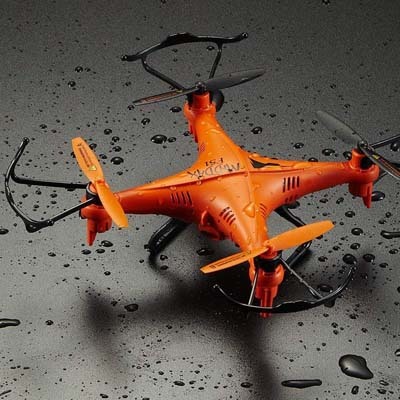 The Aviax H20 by Hosim is a fully submergible waterproof drone with 4 propellers and comes in an unavoidable orange finish. Out of all of the drones that we tested this one was probably the most fun. It is really easy to fly, it can bounce over the surface of the water and be taken straight back into flight and it also has a really good battery life. 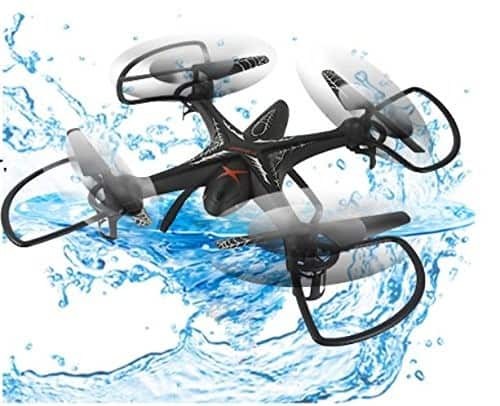 Although the quadcopter can be submerged in up to 70 centimeters of water it is very difficult to fly it out of the water once it is submerged to this level. The Aviax does not come with a camera but it is a very cheap UAV and as such, it is ideal for beginners or anyone who is looking for quadcopter drones with a lower price tag. Although this drone does not come with a camera it has been designed to accommodate one so if you want to take photography on or near the water then you can purchase a camera separately and fit it to this drone. 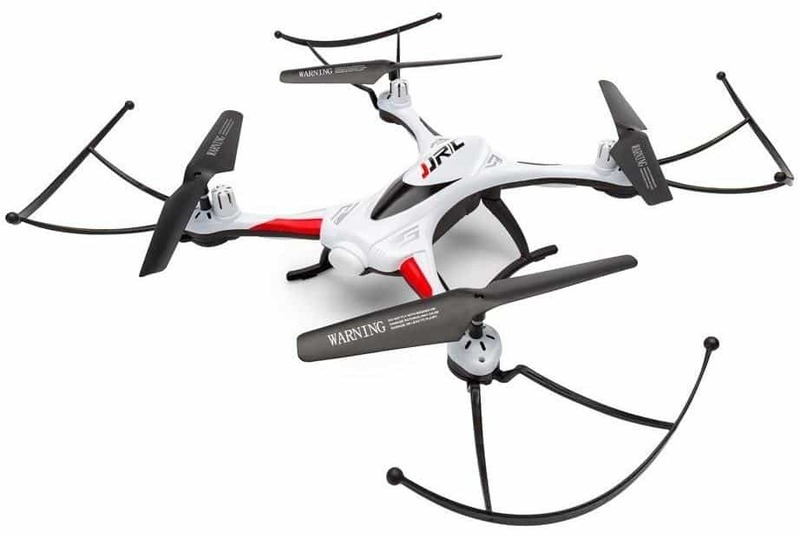 This waterproof remote-controlled quadcopter is the best all-rounder that we reviewed. Not only is it very agile, it is also waterproof to the extent that you can drop it right into the water and fly back out. 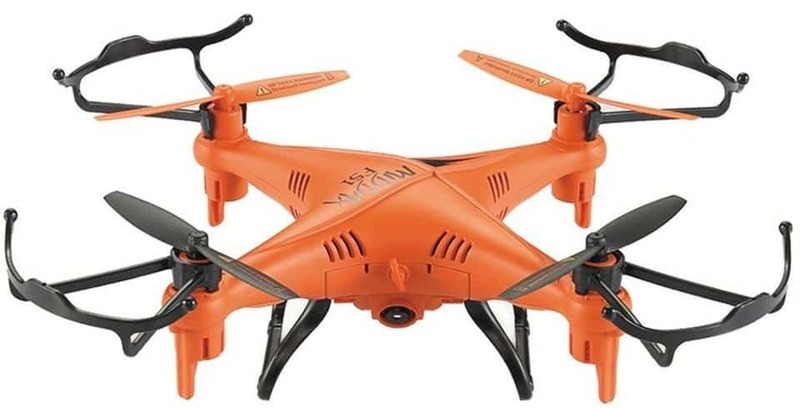 This product is also one of the best drones for sale with a camera. The camera on this drone sports an impressive 2.0 MP and is built into the front of the drone. This allows you to record still photography and video action whilst the drone is in flight. It can be quite hard to find small drones with cameras for sale but GPTOYS quadcopter fits the mark perfectly. This drone is very easy to handle as well, thanks to its headless mode operation – meaning that it can take off from any position – and its 6-axis stabilization system making it very easy to control once it is in the air. The entire craft, including the camera, is also waterproof so you don’t have to worry at all when flying it over your pool or even over lakes and rivers. It also features a one-touch return to base function so that if you fly too far afield you can easily bring the drone back to its position of takeoff at the touch of a button. 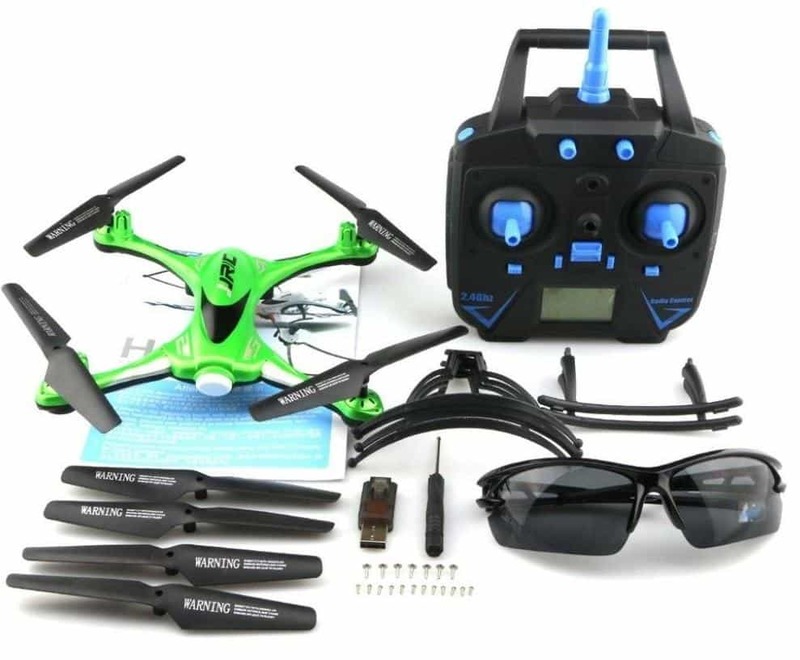 The JJRC H31 quadcopter by A-store is without a doubt the best-designed drone – the build quality is fantastic and the bright green color of the drone makes it really stand out during flight and when it hits the water. The H31 has a 6-axis gyro which gives it very stable flight and makes it easy to control. This makes it a great option if you have a young son or daughter that you are teaching to fly a drone. Everything from takeoff to landing is made really easy with the H31 and out of all the drones that we tested it feels like the one that is least likely to get damaged, even if you are a beginner to drone flying. This drone also features one-button return so that you can bring it safely back to the point of takeoff if you lose control of it during flight. It also has LED lighting so it can be safely used for night flights. 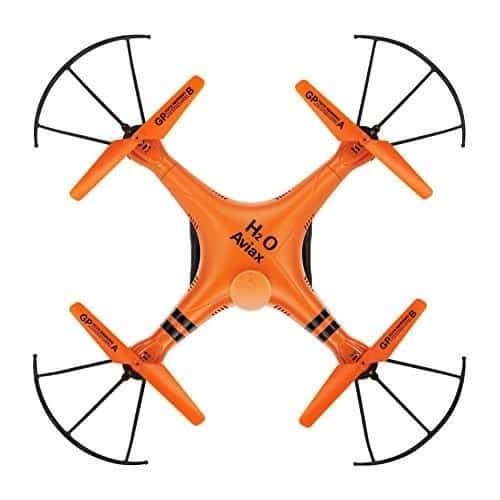 The RC Drone by OOTTOO is great fun on and around the water and we recommend it for all of you thrill seekers out there. This drone has a great set of features including headless mode for easy takeoff, one key return function and the ability to do 360 degree rolls in mid-flight. 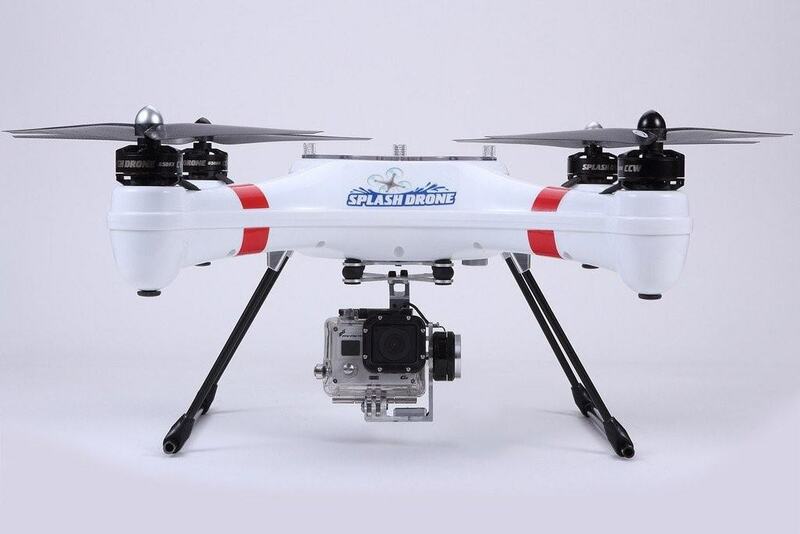 This drone is great for flying in heavy rain and also around areas with water such as rivers and lakes. The drone happily fly again straight after being submerged in water. This drone is certainly recommended for advanced flyers who want to take things to the next level – for example we had great fun doing acrobatics and summersaults with this drone. The Garlus splash drone by SwellPRO is a mariner drone for sale at the higher end of the market. We would recommend this drone for the pros out there who have tried other cheaper drones and want to move on to the next level in terms of quality and functionality. The mariner waterproof drone features a fully waterproof structure including the entire drone as well as the camera. The drone comes fitted with a GoPro camera that can be tilted during a flight from the controller and allows you to get some fantastic in-flight video footage whilst removing any fear about landing (or crashing) on the water. This waterproof drone with a camera can also be flown using an android phone by simply downloading and installing the app. This drone also comes with a case so that you can keep the drone, the controller and any other kit that you have for your drone save whilst you are transporting it to and from your flight locations. There is no doubt about it, you can have a tremendous amount of fun when you purchase a waterproof drone and it is a really great hobby to take up. 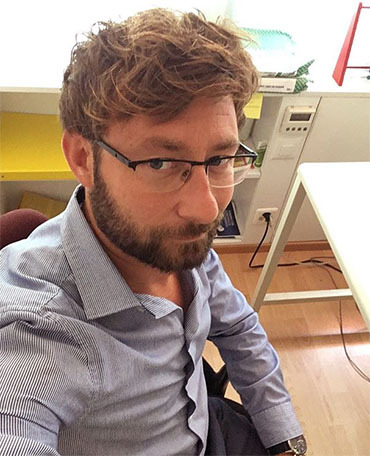 The great thing about a drone flying, in general, is that you can start off on a very small budget – for example, you can pick up your first drone for under 30 USD and then you can move on to bigger and better drones as you become more experienced. If your budget is a bit higher – say for example 100 USD – we recommend you check out this list of the best drones under 100 USD? If you are looking to purchase your first underwater drone then the Maxbo 2.4Ghz 4CH waterproof remote control quadcopter or the Hosim Aviax H2O waterproof drone is a great starting point because they offer really good value for money whilst still having some great features. If you are a seasoned drone pilot or you have some serious business to take care of then you might go for a premium waterproof drone such as the GARLUS Splash drone.However, our overall winner is the GPTOYS Waterproof Remote Control Quadcopter for its all-around feature set and ease of use. At 49.99 USD the GPTOYS drone is still in the mid-range price bracket but it offers a lot for the money. Not only is it waterproof, but it has a great design and it even comes fitted with a 2.0 MP camera.We had the most fun with this drone and it was the one that we used for the longest whilst reviewing all of these products. We believe that it is the best option for beginners who are new to drone flying and also for people who already have a land-based drone and want to purchase a second drone for use in and around water.